A scenario for Ars Magica 2nd Edition by Jonathan Tweet, Atlas Games, 1991, 64 pages. TLDR: 3 out of 5 for being generally good, but kind of missing the mark a little and hitting you over the head at the end. This is a sequel adventure to one of my favourite published adventures for any system: The Ghoul of St. Lazare by John Nephew. In The Ghoul, members of the covenant discover a corpse floating in the river. Their investigations into this lead them to a small village church and a priest with some... unorthodox... views on the matter of Christ. Their suspicions swing like a pendulum until everything comes to a head one night in the church and all hell breaks loose. We had a blast playing it and experienced some very intense characterization. The interaction between the priest and the PC monk who was sent to investigate (and had his own dark secrets) was particularly good. The two clergy both argued about the nature of Christianity in an effort to get the other to reveal their heresy, while not themselves revealing their own. So naturally I was excited to hear that there was a sequel. This scenario sees members of the covenant drawn back to the same village a year later. The villagers are trying to build a new chapel, and the old has been desanctified and surrounded by an iron chain. People have been ill, and deviltry is suspected. There are two aspects to this scenario. The first is an investigative aspect as the PCs are charged with discovering the source of a curse that has been afflicting some of the villagers. The second is that the powers of hell are active here, and they will now assault the PCs much as they are the villagers, by tempting them into gluttony, envy, sloth, wrath, or any of the other deadly sins. The scenario climaxes on the Saturday between Good Friday and Easter Sunday, when the Christ is dead and the devil has won. Can the PCs save each other from being dragged to hell by their own demons? I have mixed feelings about this scenario. I really love the idea of tempting the PCs to commit the seven deadly sins. I like how some of this temptation is achieved. I like some aspects of the investigative scenario as well, including the situation of the midwives and the red-herring that might be caused by associating witchcraft with diabolism. What I'm less keen on are some aspects of the execution. In some ways trying to explicitly tempt PCs into committing all the deadly sins over the span of 5 days feels a bit forced. If the party only has 3 or 4 people in it (as my group might) then everyone will be tempted 2 or 3 times, and it's my feeling that it'll start to look a bit clumsy. I'm also not especially enamored of the climax, which literally has demons emerge from a pit in the ground to try to drag the corrupted PCs into hell. I think if I were to run it, I'd handle it all more subtly than that. And this last bit is a curious thing, because another product from 1991, A Winter's Tale published by White Wolf contains an appendix at the end called The Devil's Advocate which deals with the subject of handling demons in your games with subtlety. 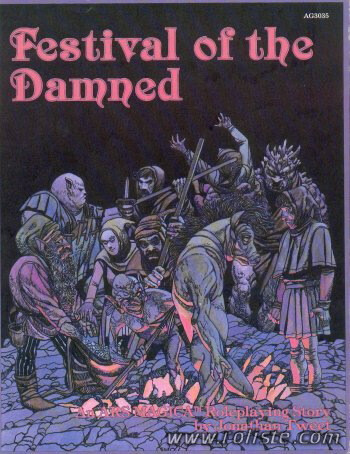 It's afar more interesting treatment than the combat demons of Festival of the Damned. I'll probably never run this scenario (and certainly not as written) but I do find some interesting things to borrow from this. As reading material goes, it's probably only of middling quality. It contains an awful lot of stats (which make pointless reading) and there's a page of pointless floorplans (do you really need someone to publish a blank floorplan of a 2-room church?) I'll give it a 3 out of 5. For different views from a couple of French guys who actually played it, see the link below. They both thought it was great.